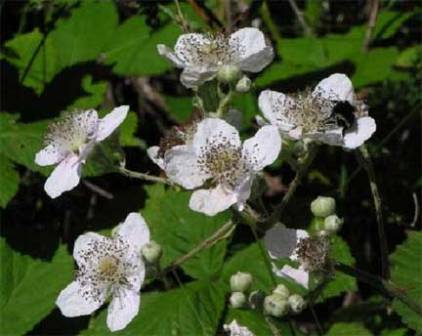 Himalayan blackberry is native to the Caucasus region in Eurasia. It has,however, reached many parts of the world. It bears tasty sweet fruits. Because of that it was introduced in America and many European countries. It is a highly invasive plant and has now started growing there more vigorously than native plants of those areas. So its planting is now being discouraged everywhere. 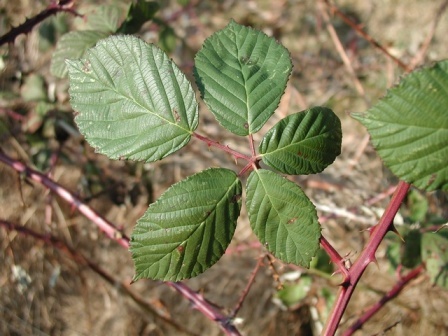 A rambling evergreen, perennial, woody shrub with trailing, stout stems that possess sharp, stiff spines; may reach up to 4 meters; stems, referred to as canes, can reach six to just over twelve meters (20-40 feet) and are capable of rooting at the tips, can attain impassable, dense thickets with up to 525 thick woody canes per square meter. Leaves compound, leaflets 3-5, sharply toothed, typically five foliolate, glabrous above when mature and canopubescent to cano-tomentose beneath. Inflorescences perfect, flat-topped panicles, 5-20 flowered with 5 petals per flower, and range from white to rose, transversely 2-2.5 cm. Fruit less than 2 cm, aggregates of black, shiny, roundish drupelets; each drupe containing one seed. Seeds small, hard and flattened. Himalayan blackberry fruits are sweet, juicy and tasty. These can be eaten fresh and also made into juice, jam and jelly. Himalayan blackberry was considered to be a very good fruit for domestication and attempts were made to grow it as an orchard fruit. But as this plant turned out to be highly invasive, so these plans were dropped. Because of this reason, it has been identified as one of the ten most problematic plants in Sweden. 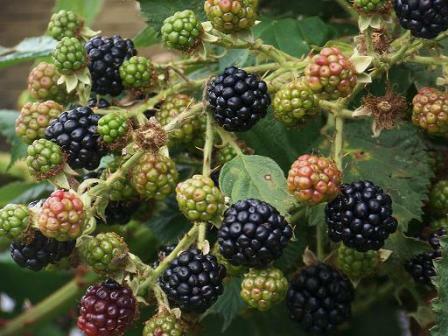 Himalayan blackberry can be propagated both by seed and vegetatively. Two superior cultivars of this fruit viz. Himalayan Giant and Theodore Reimers are also available. 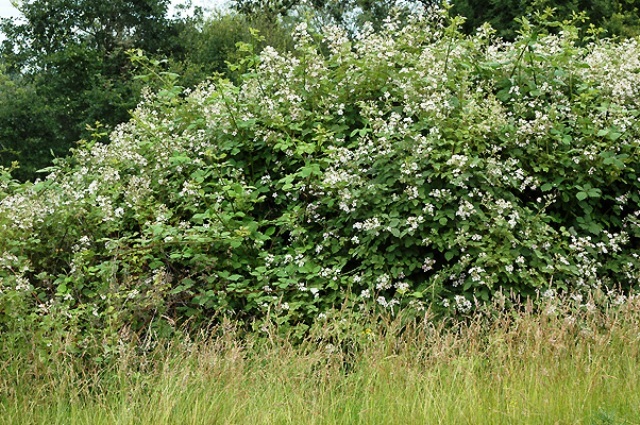 This shrub has a habit of forming impregnable thickets. So care have to be exercised from beginning to discourage thicket formation by adopting suitable pruning.